The Lumber Baron is proud to be the premier supplier of redwood lumber in the San Francisco Bay area. The appeal of redwood lumber as a building material goes beyond its strength and beauty. Redwood lumber is also remarkably resistant to decay and pests, thanks to the natural tannin in the lumber which creates much of its beauty. Ideal for exterior projects like decks, siding, fences, and arbors; The Lumber Baron offers redwood lumber for sale as a new, sustainable growth product, or as an old growth reclaimed redwood lumber product that has already withstood the tests of time. 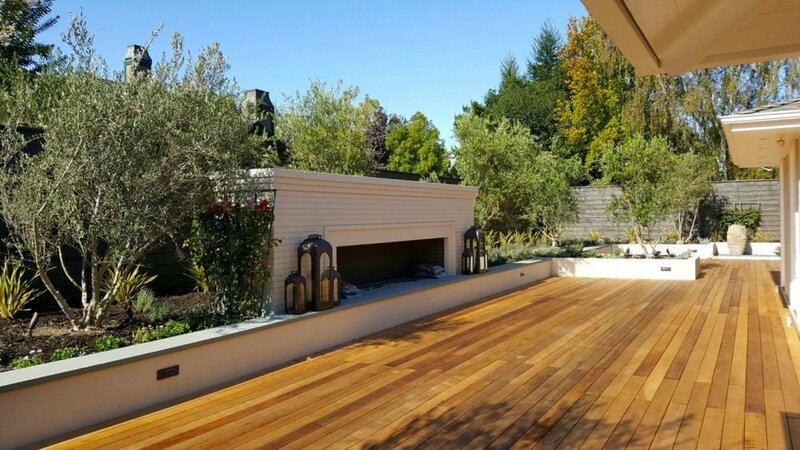 Redwood Decking – How we started and what our reputation was built on, The Lumber Baron offers the widest selection, highest quality and lowest prices for All Heart 2×6 redwood decking in the San Francisco Bay Area. The Lumber Baron is the only lumber yard that allows you to choose from five grades of premium All Heart (no sapwood) 2×6 redwood lumber for sale. All of our 2×6 redwood decking is heartwood, not the white colored stuff that quickly rots out or disintegrates which you see at our competitors or big box stores (you’re buying redwood lumber for a reason right?) We regularly stock 2′ increments from 8′ to 20′, in all five of our 2×6 redwood decking grades. Redwood Beams and Timbers – Redwood heartwood beams are a beautiful option for building an arbor or pergola. Redwood beams are beautifully colored and durable enough to stand up to decades of exterior use. Available in all five of our Redwood Lumber heartwood grades, we stock 2x, 4x, and 6x pieces in a variety of widths, as well as 8×8 beams. We also have custom milling and surfacing available to provide you with specially sized redwood lumber for sale such as 3×3 beams, rail caps, or braces. Our stock sizes range from 6’ to 20’ feet, with larger lengths and sizes available by special order. You’ll love the selection and quality of our redwood beams and redwood timbers and the fact that we stock them (call around, not many yards do) makes it that much more convenient to but from us. Redwood Lumber for Siding and Paneling – For use indoors or out, we have all heart redwood lumber for sale that is milled for beauty and strength. Rough cut siding creates a rustic appearance that cannot be matched by the whitish Redwood sold in big box stores, and our dry redwood paneling is perfect for indoor applications that are resistant to shrinkage and warping. All heart redwood siding has been a highly regarded material choice by contractors and home owners for over a century. Due to its beauty, easy work-ability, and longevity redwood siding will continue to be highly sought after. In widths ranging from 4″-12″, The Lumber Baron stocks 3 different all heart redwood siding grades. Each redwood lumber siding order is run to the customer’s exact specifications. We are also able to replicate samples of existing redwood siding most other lumber yards are unable to match. Do yourself a favor and stay away from cheap alternatives like cement, sapwood, and finger jointed wood products. They may seem like a “good deal” but all are easily damaged and can split wide open. Nothing worse than paying someone to do the same job twice! Maintain the integrity of your home and replace that redwood siding with…redwood siding! Why change to cement or worse yet, tiny pieces of sapwood lumber that are pressed and glued together. When you really think about what you’re buying it just sounds cheap, doesn’t it? Nothing they have come up with or will ever come up with, will match the warmth, beauty, and longevity of real redwood all heart siding. Buy the best, it’s the cheapest in the long run. If a more rustic or old growth appearance is desired, please see our different reclaimed redwood siding options. Managed New and Old Growth Redwood Lumber – Our redwood lumber for sale is environmentally friendly. We sell only sustainably managed new growth redwood in green and dry varieties or a large selection of vertical grain old growth redwood lumber that is either salvaged or carefully deconstructed from buildings and structures throughout the West Coast. Based on your desired appearance, you can decide whether to use rough cut lumber or take advantage of our custom surfacing capabilities for a smooth, clean finish. Redwood Fencing – Our stock of redwood material for fencing is made of all heartwood and is available in all five of our redwood grades. Unlike most of our competitors and all of the big box stores, our fence boards are a full ¾ inch thick. They also run up to ½” wider than most fencing boards meaning you’ll need less material to complete your project. The Lumber Baron offers a complete line of redwood fencing, including pickets, posts, rails and lattice panels. We even carry Hill and Dale redwood fencing material to provide superior privacy in true good neighbor style fence. At the core of our product list, The Lumber Baron’s selection of redwood lumber for sale is extensive. Select the thickness, width, and length you need, then use our grade chart to decide which quality is right for your application. We search out the best managed redwood and hand-selected reclaimed redwood material available. To top it off, we provide custom milling and surfacing to give you the perfect look and fit for any project you undertake. We even provide delivery to the job site, so you can rely on your lumber being available when and where you want it. The Lumber Baron is family owned and operated. With over four decades of service to the Bay Area and beyond, we have become the region’s premier lumber supply company, with a reputation built on superior redwood, western red cedar, reclaimed lumber, and of course, customer satisfaction. We are proud of what we offer and are happy to share a peek at some of the finished jobs our customers have created with our material. With a new 3.5 acre site currently under construction on the Richmond waterfront, complete with inside storage, an expanded milling operation, a show room and a vast hardware selection, we look forward to being able to expand our Reclaimed Lumber selection and free up much needed space at our Albany yard. Available in limited quantities, we also offer a selection of old growth vertical grain and Clear All Heart redwood lumber. Cut from salvaged logs, with a fine grain count, this lumber is the finest available redwood on the market. We also have a large selection of 4" and 6" newer growth, dense, vertical grain material.